We’re delighted to say that pubs across Norfolk are once again supporting local charity It’s On the Ball in raising awareness for testicular cancer. Although traditionally our main campaign for the charity takes place in January we thought we would sneak an extra brew out just to keep you guys, and girls, talking. To us, supporting It’s On The Ball is a no brainer, by spreading a simple message we can all easily help save lives. 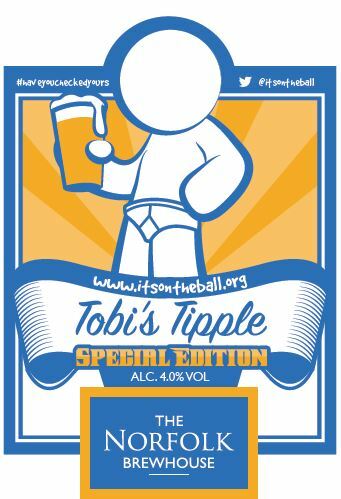 Indeed during our last campaign in January we know of at least one gentleman who while drinking a Tobis Tipple took the message on board and unfortunately found that he had the symptoms of testicular cancer. Thankfully the man in question has been receiving excellent care – and the outlook for him is encouraging. While incredibly heartening to know that we made a difference to this chaps life, it also shows the simplicity of what we are trying to do – just spread the word. 98% of cases can be cured if caught in time – so the best way you can help is to talk about it, if you tell your mate, who tells their mate, who tells their mate we can get there! We do the easy bit, we just brew the beer, the pubs do the nice bit, they get to serve the beer and chat to their community – the real hard work is done by the small and totally dedicated team at Its on the Ball – who with limited resources do all they can to help raises awareness of this killer disease. Oh, and as for our main promotion for It’s on the Ball in January, well watch this space there’s a lot more to follow.